The Huntron Workstation Remote Control feature allows control of the software from other programs. 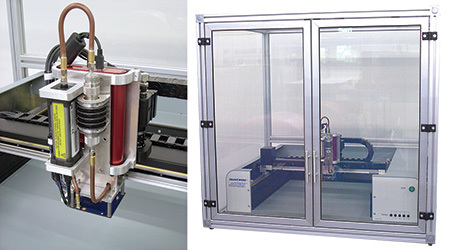 Tests are created in Huntron Workstation and then “controlled” remotely. The process of adding Huntron Prober capabilities to other programs and testers using drivers requires programming by the customer. Huntron Workstation Remote Control makes this easier by providing most of the functionality needed with minimal programming. Remote Control is used by programs linked to the Huntron Client VB.NET DLL. 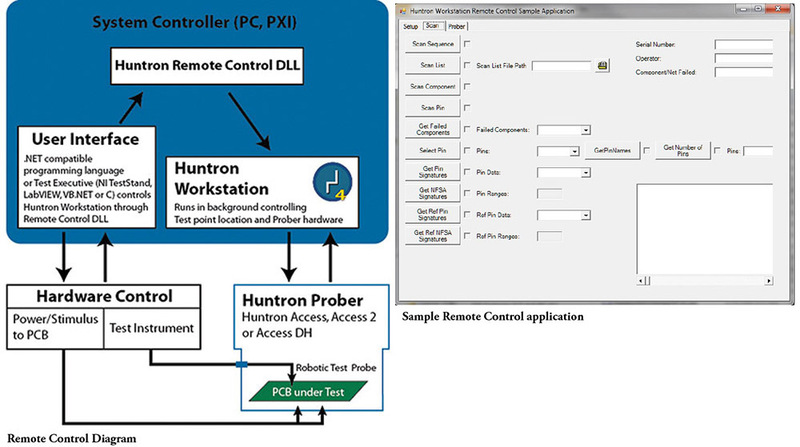 The DLL provides call functions used to control the Huntron Workstation application. This system used a custom head design added to a Huntron Access 2 Prober. The entire system was enclosed in a custom cabinet. The customer required the ability to test unpackaged RF FET modules by precisely placing eight pins and executing the test. Mounted on the test head are a Holsworth RF synthesizer, Aeroflex fixed coaxial attenuator, Boonton RF power sensor meter interfacing to a multi-point sping probe assembly. The multi-point spring probe is lower to the PCB under test using a leadscrew motor assembly. This motor assembly allowed the system to handle the heavier load of the combined assemblies mounted on the head. A version of this leadscrew design was later incorporated into the new Access DH head assemblies. Separate power and USB cables were installed into the Access Prober cable harness for control and power. The customer wrote their own instrument measurement software but used Huntron Workstation with Remote Control to control the test point locations and Prober movement.